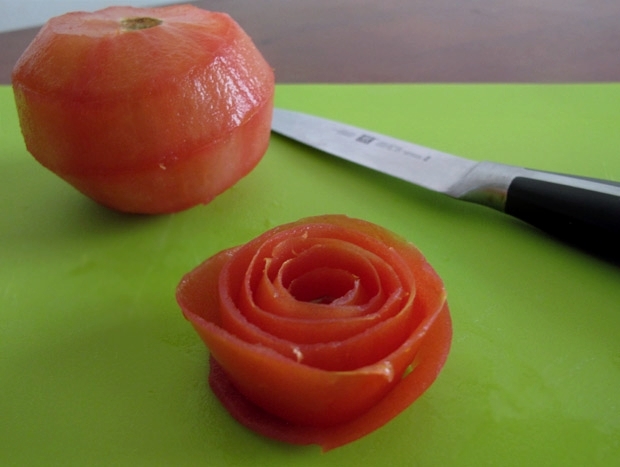 (1) From the top of the tomato, cut a semi-circle around the stem, about 2 cm away. (2) Slit it around the whole tomato- maintaining the same width. Remember not to cut too deep as you only want the skin of the tomato. (3) Cut all the way until the bottom of the tomato. 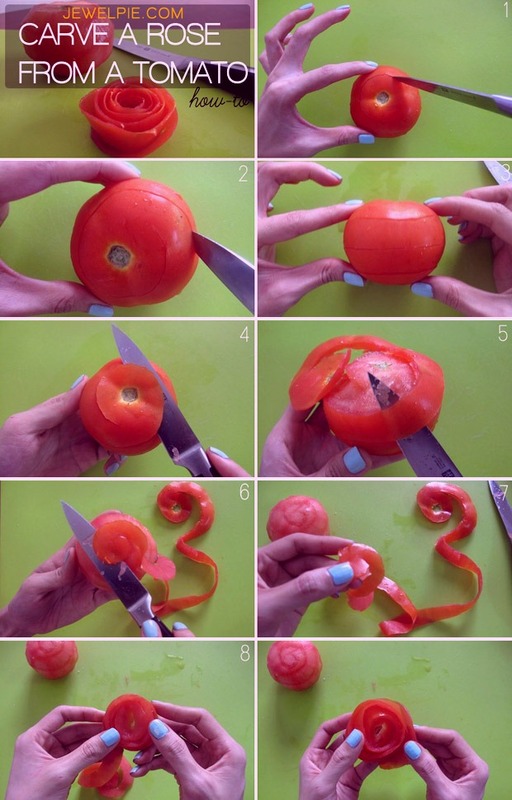 (4) Cut horizontally from the top to remove the outer strip of skin from the tomato. (5) Continue cutting all the way until the end. (6) When you reach the bottom, cut the strip off from the tomato . (7) You will have a long strip of tomato skin. 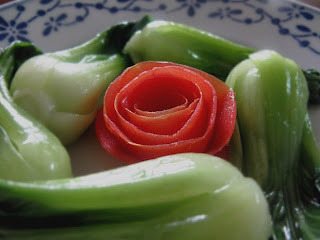 (8) Roll it to form a rose. 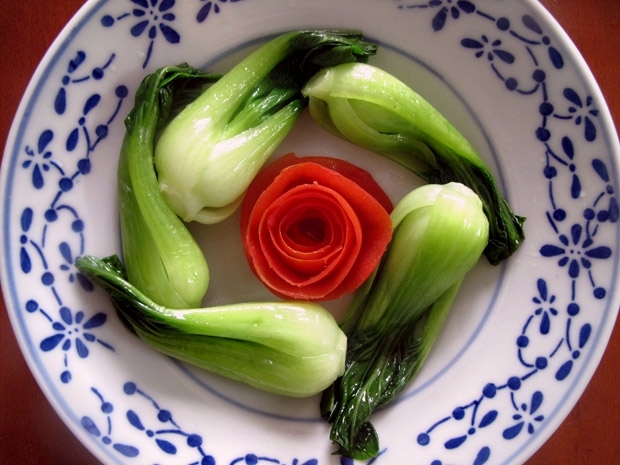 It’s such a beautiful garnishing to a simple vegetable dish. 1) Take watermelon and cut in equally half. Get on half and leave the other half behind. 2) Cut a 1inch thick slice. Cut it vertically. This should be a long slice. 4) Take one piece then cut out a square. Don't include the green part. 5) Cut off the bottom 4 edges of the square. 6) Cut small pieces off the 4 edges on top. 7) Carve some "C" on the corners. Make it thin. You should make 3 "C". 8) Carve some "V" around the center. Again, make it thin. You should make 2 "V". 9) Carve a small "O" in the middle. Only one "O". 10) Smooth the edges for a better shape. You should now make a rose like shape. You can repeat the steps until you get the desired amount...watch above video for better idea. following the declared theme. 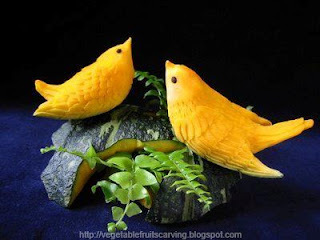 Artistic skill in carving will have great impact on scores. 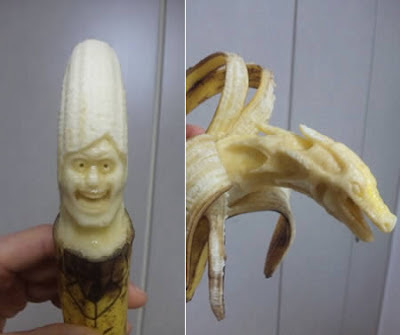 The art of carving fruit can be highly detailed when done by experts, simpler carvings can be used in daily production, such as those shown here, which can be completed in from 2 to 15 minutes. 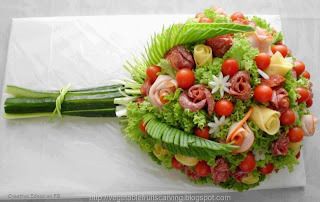 Fruit and vegetable carving, which is often a major component of a garde manger's skill set, is rarely taught in U.S. culinary schools; however, videos and seminars can be found on the Internet. although advanced skills take years and an innate artistic skill to master, simple techniques for daily production can be learned quickly and used to add the "wow" effect to a fruit display. 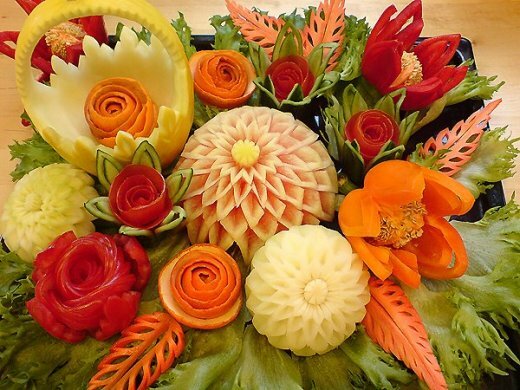 With so many styles, techniques and skills displayed in fruit carving, it is yet another area of culinary arts that should be learned, and one that will help to elevate our profession to an even higher level. 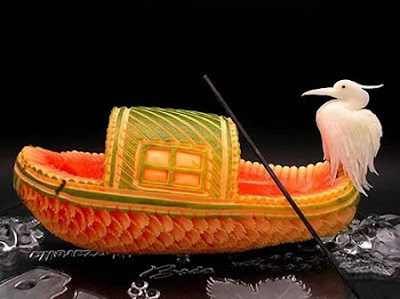 The detailed techniques used in both fruit and vegetable carving came to the U.S. from Asia, where it has been practiced for more than a thousand years. 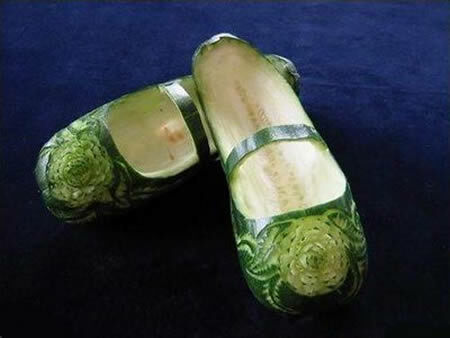 The traditional styles come from China, Thailand and Japan. The Chinese style is perhaps the oldest, and is said to have originated during the Tang Dynasty in the 6th century. 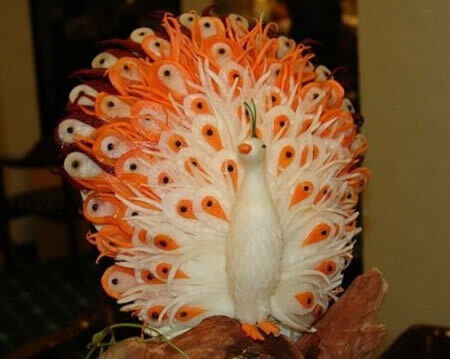 In the traditional Chinese style, carvings are often three-dimensional and crowned with small animal figurines. In Thailand the art is called kai-sa-luk, and is said to have had its beginnings in The Royal Palace, Sukothai, about 700 years ago. Because it was once feared that this art would be lost, today it is taught in schools from the early grades through university. The other traditional style of carving, mukimono art, comes from Japan and is said to have been popular during the Edo period, 1600-1800. Classic mukimono carvings typically have clean, precise lines. Fruit and vegetable carvings are a great way to garnish a tray for a party or a special occasion. 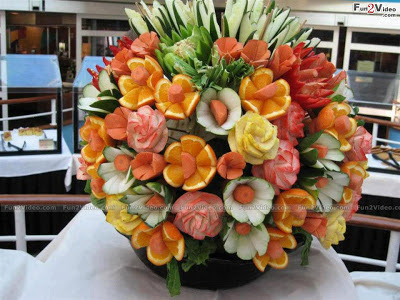 How to learn fruit carving easily? 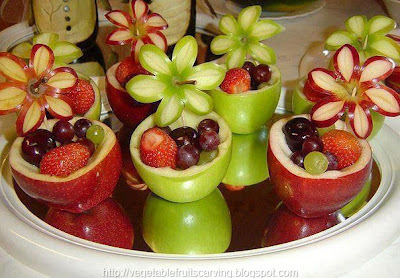 Fruit carving art for kids too. 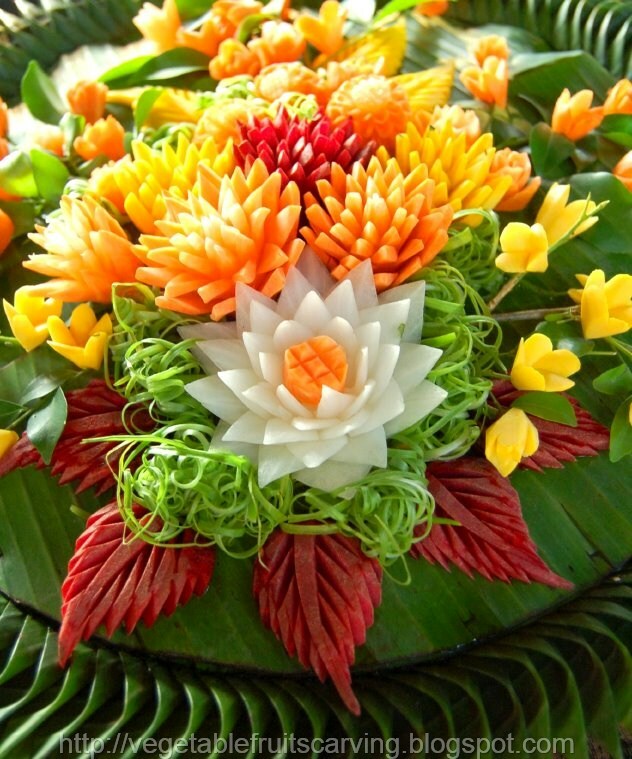 Make beautiful flowers shape by using vegetable fruit carving art . 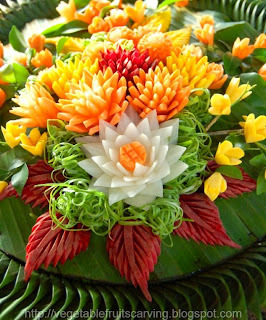 this is very nice art of vegetable and fruits carving. 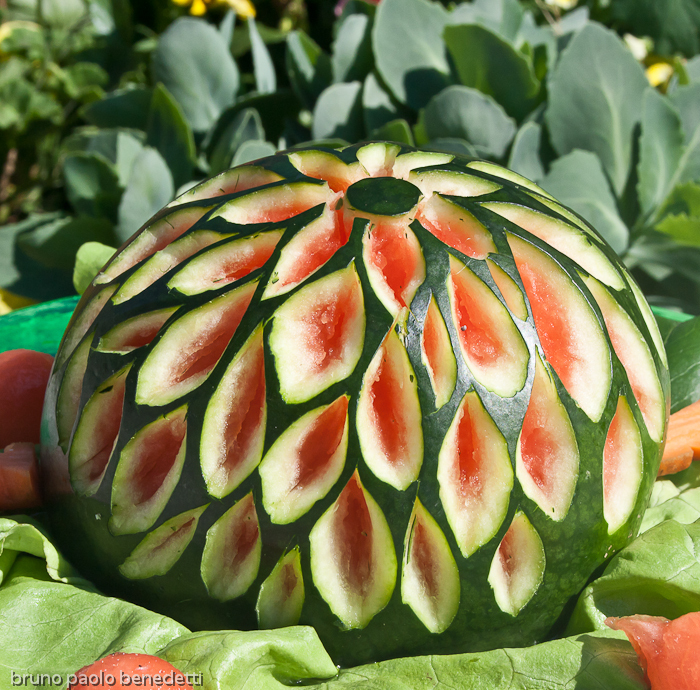 We are trying to give few tips to make a swan out of a watermelon. Cut a big chunk from one end of the watermelon so that it can sit on a table. No more wobbling. 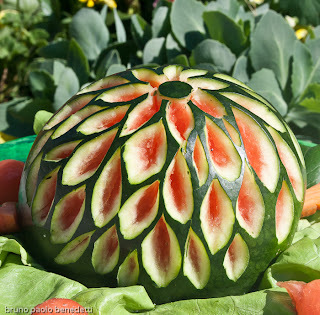 Trace out the swan on a tracing paper then tape it onto the watermelon and trace it out. Use dark markers or the sharp tip of a knife to trace the design. Once the design is done, cut out the design right through the rind. Be careful while doing so as the beak and the wings should be intact. The beak especially being small may just fall off. Hollow the eyes with a knife. Do not remove the unnecessary parts by taking them out all at one time. Draw out four parts and then slowly remove each part. It may take more time but it certainly brings out a better job. Trim the feathers of the swan slowly, so that they are not too thick and take care that they do not get too thin. 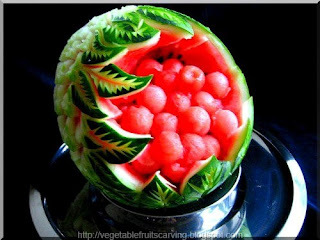 Fill the empty melon with cut fruits. So it looks like a fruit dish.